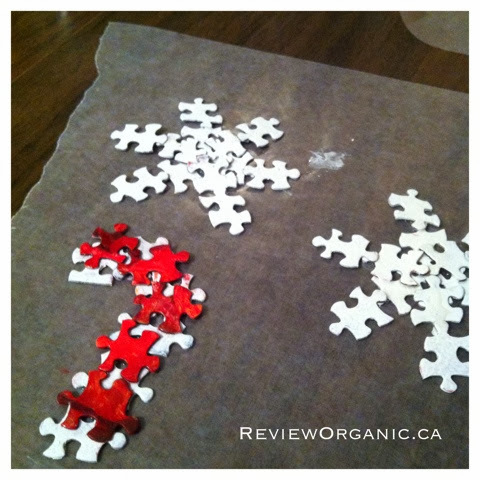 Looking for a way to reuse old puzzle pieces? Looking for a new DIY craft idea? What about a holiday DIY craft idea? If you answered yes to any of the previous questions, read on because today I am going to teach you how to make Christmas decorations. Puzzle Ornaments. This is a great way to reuse jigsaw puzzles that are missing pieces, We painted most of the pieces white and a few pieces red. We needed to make the majority of peices white for the snowflakes and half of the candy canes. We painted a couple edge pieces but not many, I really only wanted the edge pieces for the very tips of the candy canes. 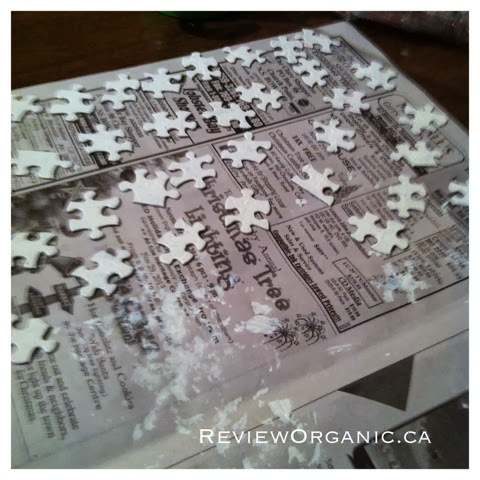 Afterwards, we glued the pieces together to form snowflakes and candy canes. I recommend glue that dries clear, do not be afraid to use copious amounts of it. In fact, I encourage it. The final step will be to tie ribbon around each of the ornaments after they are dry. The children and I really had a good time making these together. This is a great activity to do with kids. What kid doesn't like to make things? What are your favorite holiday DIY craft ideas?